Marvel Studios Phase Three: Civil War, Black Panther, Captain Marvel & More! A number of the press were recently invited to a special Marvel Studios event, with very little details to go on. Today the crowd gathered in anticipation, with rumors and speculation running rampant, especially considering the recent news that Benedict Cumberbatch may take on the role of Doctor Strange. Kevin Feige took to the stage to show the new trailer for Avengers: Age of Ultron, which has been seen by over 70 million people. He was also there to make a few announcements, which he called “Comic-Con level news.” And he did not disappoint. Following in the footsteps of the recent Warner Bros. film slate announcement, Kevin Feige and Joss Whedon announced the next 8 films from Marvel Studios, revealing titles for upcoming sequels, as well as introducing some new faces for the Marvel Cinematic Universe. After a brief recap of the first 10 films of the MCU by Joss Whedon, which made over $7 billion, the first sequel title was announced. We’re going to move pretty fast through these announcements today, with a more in-depth examination to follow. After a bit of a fake out, it was finally revealed that the title of the third Captain America will in fact be Civil War. We had already assumed as much following the announcement that Robert Downey Jr. will be joining the film. Both actors appeared on stage near the end of the presentation, when the real title was revealed. While there was no official announcement that Cumberbatch will be taking on the role of the Sorcerer Supreme, Feige did tease a bit about the story and his involvement with the MCU. Doctor Strange will introduce the supernatural to the MCU, while also exploring parallel dimensions, which potentially blows our mind. Marvel Zombies, anyone? The third film in the franchise was described by Feige as “the end of all things.” Chris Hemsworth and Tom Hiddleston will return, and the film will take place following the events of Avengers: Age of Ultron. We can only imagine what to expect in Asgard when Ragnarok comes around, but we’ll be there to see it. After years of rumors and recent teases in the Avengers: Age of Ultron trailer, Marvel Studios finally revealed that we will be seeing Black Panther. That wasn’t the only announcement, as it was also revealed that Chadwick Boseman would be playing T’Challa, the Black Panther. He joined Evans and Downey on stage, who welcomed him to the fray before asking him to pick a side (this was following the Civil War announcement). Marvel also revealed our first look at some concept art for the look for the Black Panther, which we will see first in Captain America: Civil War . Another long-rumored film was officially announced, one Feige said has been in the works as long as Doctor Strange. Captain Marvel was confirmed by Feige as the Carol Danvers version of the character and will feature a mixture of Earth origins and cosmic adventures. While she isn’t the first Captain Marvel, Carol Danvers has been an important member of the Avengers and the Marvel Universe as a whole for a long time, so we couldn’t be happier with this announcement. 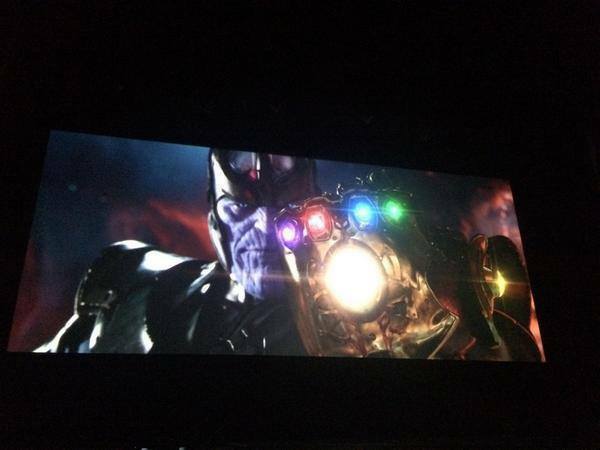 Feige called this the culmination of everything, and showed a number of clips from the initial stages of the MCU that will inevitably lead to both Thanos, and the Infinity Gauntlet, who were both shown prior to the title screen. The third Avengers film will be split into two parts, released a year apart. With the first sequel still a ways away, we can’t even begin to start geeking out about this film quite yet. And with that the main presentation ended, followed by a press-only Q & A with Kevin Feige. Marvel Studios sure knows how to put out a presentation, and as excited as we were to hear about the upcoming Warner Bros. slate of DC movies, it was a little better to see how excited Marvel is about their own upcoming slate of films. We’ll have a more in-depth look at all of these upcoming films over the next couple of weeks, so be sure to keep it locked to Grizzlybomb for more. Which of these announcements are you most excited to see? What do you think of Chadwick Boseman as T’Challa/ Black Panther? Let us know in the comments section below or join the discussion on the Grizzlybomb Facebook page! Previous PostGotham: The Spirit of the Goat and the Soul of Harvey BullockNext PostHalloween Movie Tunes To Freak Out To!